The Argument of the Month (AOTM) Club promises to have the audio of the debate available at their site soon (check the 'Media' link on the previously linked site). They have a before-the-fact "preview" of the debate on the above website, and there's also this pre-debate discussion between Ferrara and Michael Matt. My hunch is that it would have been pretty predictable; yet it would have been fun. Mark Shea... Mark Sh... wait. I am a Christian. I need to stop typing. I recently read a piece by a young buck, and 18-year-old kid who was given a scholarship to work with Michael Voris' staff at Church Militant, and then found he was too much of a "Church-of-Nice" guy to continue working with them. 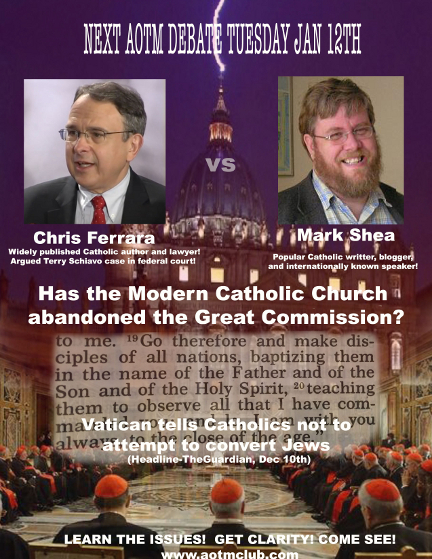 MARK SHEA was the FIRST to post a comment beneath the kid's long and meandering 'manifesto', and, echoing Cardinal Dolan's memorable word, Shea's first word was ... you guessed it: "Bravo!"